No doubt you have been inundated with information and analyses regarding last night’s Best Picture announcement flub. But what the hell, here’s another nugget! It seems that the confusion might have been exacerbated by the tension between presenters Faye Dunaway and Warren Beatty. You see, both wanted to announce the winner. Sources who witnessed Saturday’s rehearsal say that Dunaway and Beatty squabbled over who would do the honors, but that ultimately Beatty gave way. The resolution, however, was not a friendly one. During blocking, the veteran actors refused to walk out together. 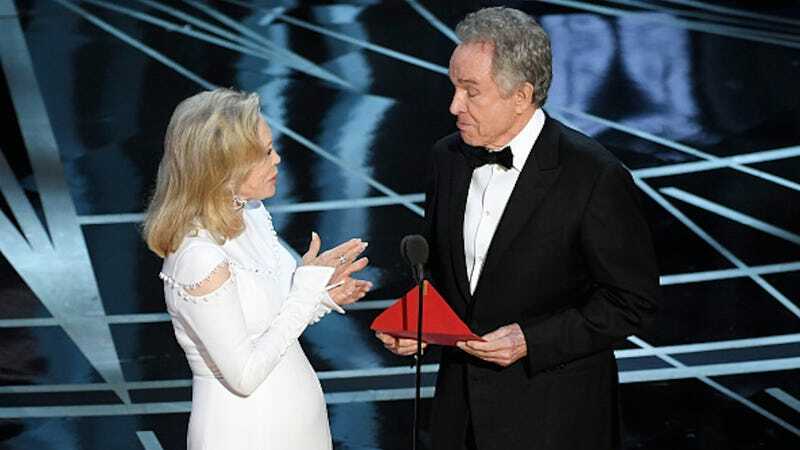 And during the ceremony itself, you might have noticed that Dunaway seemed a bit anxious to take the envelope from Beatty — perhaps she thought he wouldn’t keep his promise? As it turns out, Beatty did — what he didn’t do was tell Dunaway why he had stared so long at the envelope. He merely passed it to her, and she quickly announced the wrong winner. Study the clip at your leisure. I’m sure we’ll be mining this snafu for months. Oh hey, Gossip Guy Penn Badgley married Domino Kirke in a Brooklyn, New York courthouse! Here they are basking in the afterglow. Domino is sister to Girls star Jemima Kirke, who tweeted a delightful blessing to the couple. And donning their courthouse wedding fashion—good on ‘em—Domino and Jemima posed with their other sister, Lola Kirke, for a sweet photo. Kirke’s son, Cassius, is also featured avec beanie. Savannah Guthrie would like to share with you the magic of her maternity leave. Be forewarned: at one point the family of four sports matching pajamas, and it’s...a lot. The tiny humans are very adorable, though.